Beautiful home decor pieces Sherrie. 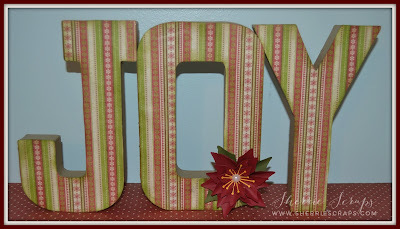 Love the paper on the JOY! The wreath is stunning. Love the rich colors and the striped ribbon. Sorry to hear about your Dad! Will keep him in my prayers <3 --- I love love love these projects!! Just soooooooooooooo gorgeous!!!!!!!!!!!!!!!!!! Sherrie, I am keeping your Dad in my thoughts and prayers. I hope he is feeling much better each day. And I mean when I said to not worry about commenting. You just focus on your family and taking care of yourself so you don't get run-down during the holidays. Your home decor projects are stunning!! I love the joy!! You decorated it beautifully!! 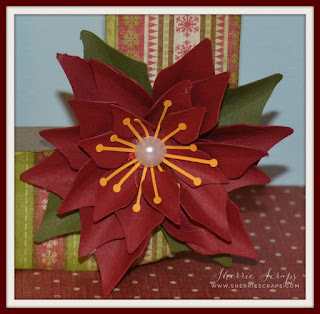 The papers are gorgeous and the poinsettia is a perfect touch!! And wow - the wreath looks amazing!! I bet it looks so beautiful hanging on a door!! The pearl centers are such a pretty touch!! Love, love both of these!! So festive and fun!! Thanks for playing along at DL.ART!! I am so sorry to hear about your dad's health. Things like that are never easy for the patient or the family! I am totally loving your decor projects! That wreath is absolutely gorgeous. Have a wonderful day! Sorry to hear about your dad Sherrie. Sending prayers to you and your dad. Your project is beautiful. Oh so sorry to hear about your dad! My dad fell down his stairs a couple of months ago and broke his pelvis still not the same! Love the projects! That wreath is so awesome! I love how you added the flower to your joy also. I haven't commented lately either because I was out of the country for two weeks so trying to catch up. Sherrie these are gorgeous projects!!! 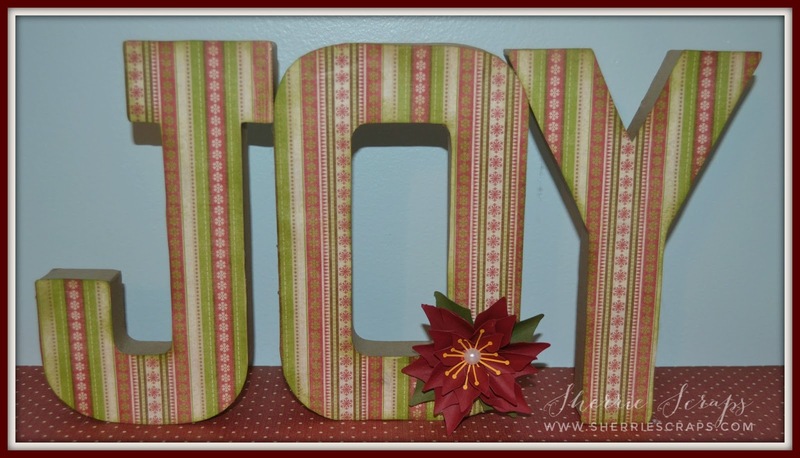 I love that poinsettia file... how precious are those word blocks?!! They are just the perfect size to display too! Love the wreath!! What a beautiful project to display on a door.... or on a nice wall space! You did a great job hon! And I hope everything is okay with your father. I have sent up some prayers for him for a speedy recovery and minimal pain!! Keep us posted! love it what a fabulous Christmas project! Sherrie, your home decor pieces are absolutely beautiful! So sorry about your dad, hope he has a speedy recovery, prayers for you and your family. Wow, wow! These are gorgeous, Sherrie! Fabulous poinsettia flower! Looks amazing in the different colors, making up a whole wreath! And love your letters, too! Such wonderful home decor or gift ideas! So sorry to hear about your dad! Sending best wishes for a very speedy recovery! So sorry to hear about your Dad. I will keep him in my prayers for a speedy recovery. I love the pretty poinsettias. The home decor is beautiful.The wreath is GORGEOUS!! Wishing your dad a speedy recovery, will keep your family in my prayers! I love your home decor! 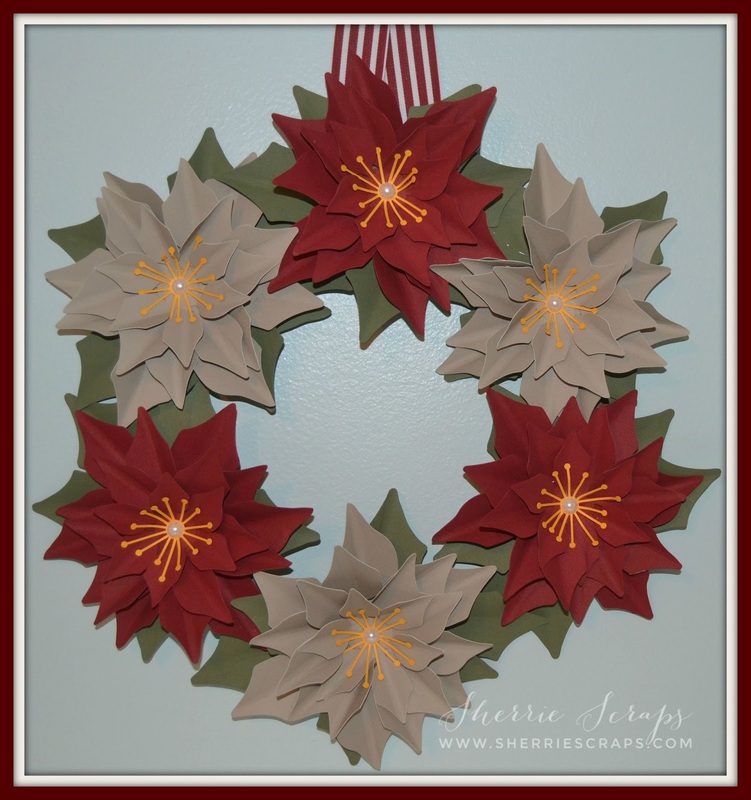 The poinsettia wreath you created looks so amazing! Those wooden letters are just as stunning! Love your projects! I'am so sorry to hear about your Dad. I hope he has a speedy recovery. Your home decor projects are beautiful!!! I'm behind in my visiting and commenting so am just now reading about your Dad. I am sorry to hear about him!!! Ya'll will be in my prayers!! !